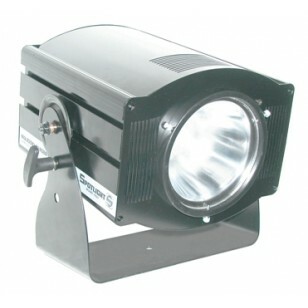 A high powered LED from the Spotlight brand, made in Italy. High intensity 100W RGBW LED module with beam spread from 12º spot to 50º flood in red, blue, green and white dies for a softer mix of the colors. It is a compact LED lantern of 100W in very high density RGBW chip that performs an adjustable zoom from 12° to 50°. Thanks to the mix of RGB and W it can generate a nearly infinite mix of colors and, according to the set up of the fixture, generate white light of predefined color temperatures from 2900°K to 6000°K. The system can work through DMX control both for color effect generation and for selection of different color temperatures. In addition the module can work as stand alone system with static and dynamic colour and effect presets.